All remaining dates have SOLD OUT! 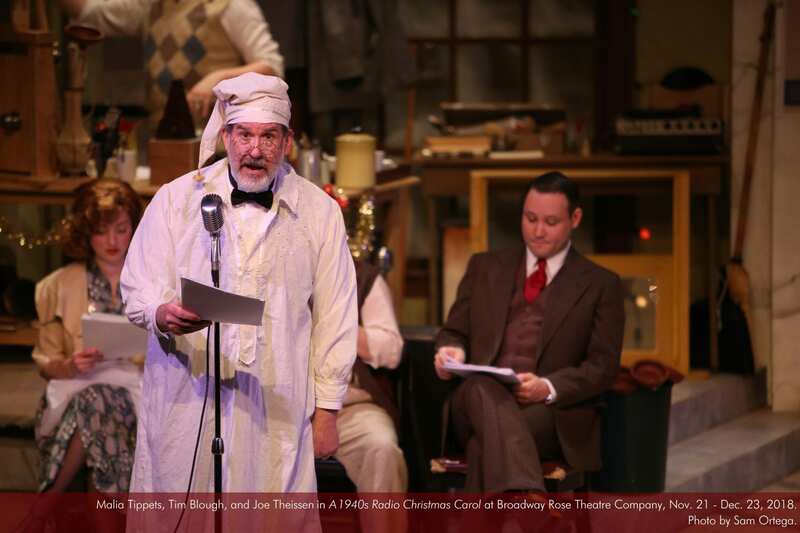 Step back in time to Christmas Eve, 1943, as the Feddington Players present A Christmas Carol live on-air. 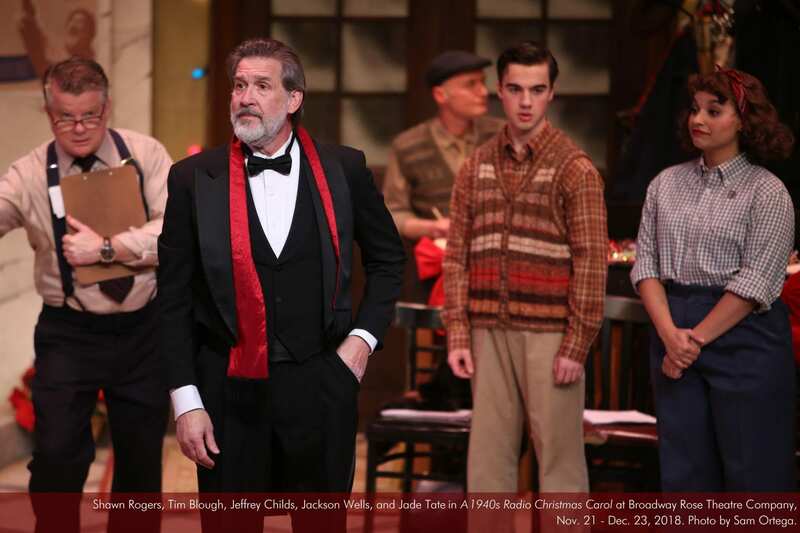 After an endless stream of interruptions, technical snafus, and theatrical missteps threaten to tank the broadcast, the company improvises a film noir spin on the classic Dickens tale. 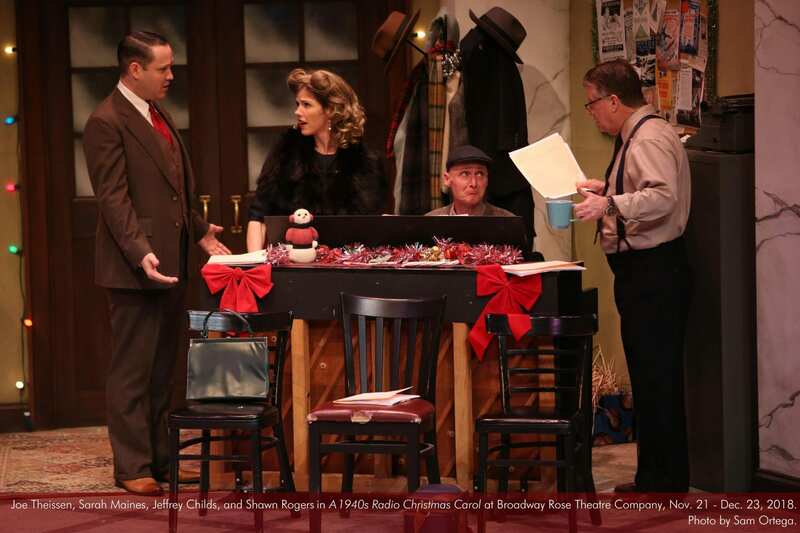 Sprinkled with swing arrangements of Christmas standards and original songs in the period style, A 1940s Radio Christmas Carol is the festive comedy to sweeten your holiday season. 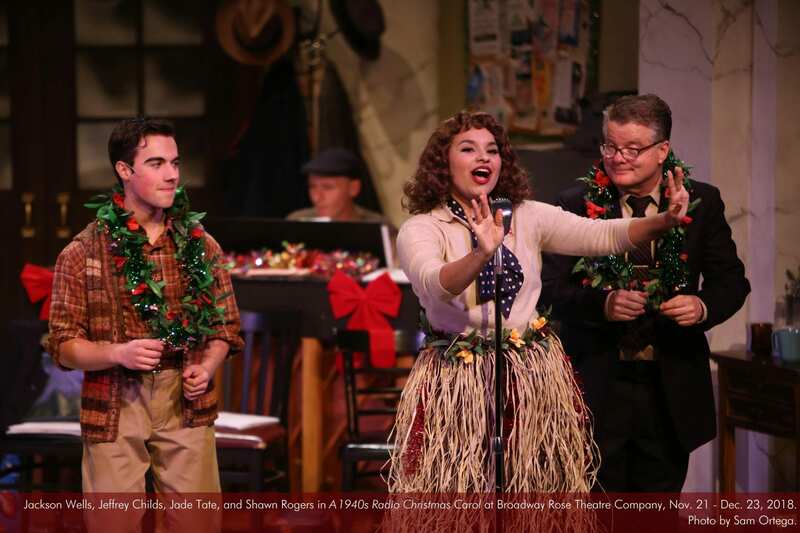 Broadway Rose Theatre Company is honored to partner with Good Neighbor Center to help local families struggling with homelessness, so that they might experience the warmth of the season while receiving safe emergency housing and supportive, empowering services. 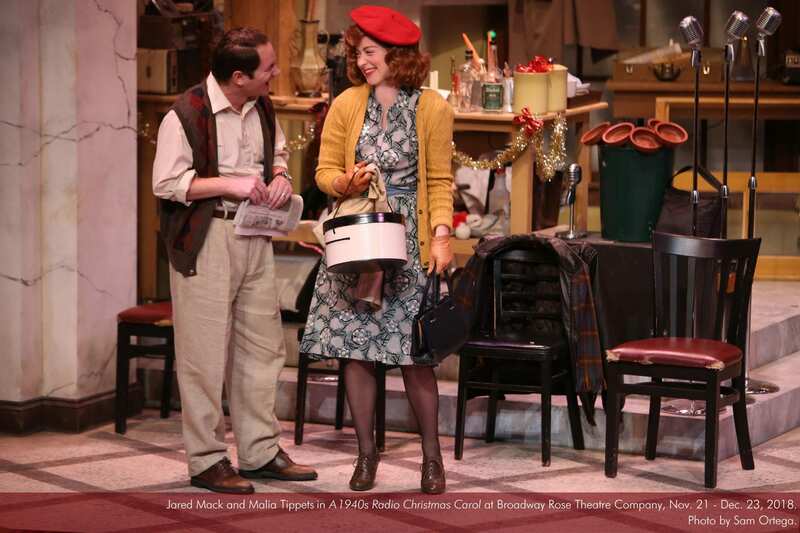 To help our neighbors in need, simply bring your unwrapped gift of any of the needed items list here to any performance of A 1940s Radio Christmas Carol or to the box office during business hours. There will be collection bins in the lobby. Thank you! Tim Blough (William St. Claire) is a member of SAG/AFTRA as well as Actors' Equity and has been acting professionally for over 35 years. He has more than 70 plays to his credit, as well as numerous independent films, commercials, and TV appearances, including TNT's Leverage and NBC's Grimm. He has appeared on stages in Arizona, California, Florida, Idaho, Texas, Washington, and Virginia. Roles include Lear in King Lear, Lopakhin in The Cherry Orchard, Bolingbroke in Richard II, Starbuck in The Rainmaker, George in Of Mice and Men, Finbar in The Weir, Crabble in Fly By Night and Atticus in To Kill A Mockingbird. Tim is thrilled to be returning to Broadway Rose again! Jeffrey Childs (Toots Navarre) is a Portland-based music director, pianist, and vocal coach. 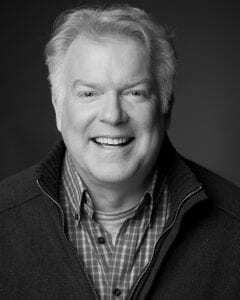 Previously at Broadway Rose, Jeffrey has music directed Guys and Dolls, The 25th Annual Putnam County Spelling Bee, The World Goes ‘Round (Drammy Award, Portland Area Musical Theatre Award), Oklahoma!, and many more. Other credits include conductor for Little Shop of Horrors, and assistant music director for The Color Purple and Sweeney Todd at Portland Center Stage; musical director for James and the Giant Peach, Jasper in Deadland, A Year With Frog and Toad (Drammy), and others with Oregon Children’s Theatre; and musical director for Violet and 13 the Musical with Staged! Jeffrey is also an instructor for summer camps and classes at Oregon Children’s Theatre and Spotlight. Before moving to Portland, he owned and operated Theatre ETC., a performing arts school for children; was the staff accompanist at California State University, Chico; and was a member of the Broadway Junior development team at Music Theatre International in New York City. Jared Mack (Charles “Cholly” Butts) is excited to be back for his second show with Broadway Rose. An Oregon Native, Jared spent over a decade performing and studying, from the Midwest to Moscow. 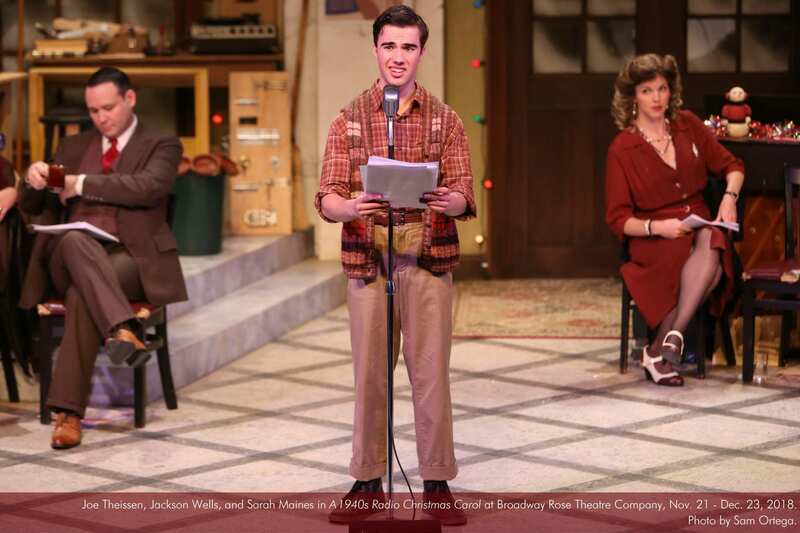 He has recently been on stage with Portland Shakespeare Project, Bag&Baggage Productions, PassinArt, Big Bridge Theatre Consortium, and Oregon Children's Theatre. Jared received an M.F.A. in acting from Northern Illinois University and a B.F.A. in theatre from Hunter College. He teaches acting at George Fox University, Oregon Children's Theatre, and Northwest Children's Theater. He lives in Battle Ground with his wife Piper, and three kiddos, Nevaeh, Saphira, and Gander. Shawn Rogers (Clifton Feddington) is excited to finally be working with Broadway Rose Theatre Company. He was last seen in Pixie Dust Production’s Beauty and the Beast. 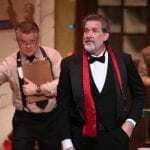 His many credits include Portland Opera’s Candide, Street Scene, and Show Boat; Artist Repertory Theatre’s Assassins, Oregon Symphony’s Guys and Dolls, The Music Man, and Camelot; Lakewood Theatre Company’s Into the Woods, A Little Night Music, Sugar, The Boyfriend, and Crazy For You, Portland Repertory Theatre’s Putting it Together, and Stumptown Stages’ Urinetown. His favorite roles include Moonface Martin in Lakewood’s Anything Goes, Riff in Portland Civic Theatre’s West Side Story, The Narrator in triangle productions’ Blood Brothers, Nicely-Nicely in Guys and Dolls, Hugh Dorsey in Parade with Staged!, and Frank N. Furter in Storefront Theatre’s production of The Rocky Horror Show. William Shindler (Isadore “Buzz” Crenshaw) couldn’t feel more blessed to be back at Broadway Rose after spending the summer as Rusty Charlie in Guys and Dolls. Regional credits include Vinnie DiRuzzio in Lucky Stiff at Broadway Rose, triangle productions!’ Book of Merman, and Charles Thompson in 1776 at Lakewood Theatre Company. 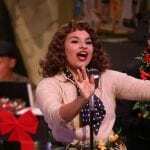 Jade Tate (Sally Simpson) is so excited to be performing in A 1940’s Radio Christmas Carol. This is her first mainstage production with Broadway Rose, but she was recently seen here in the children’s production of Beauty and the Beast. Some of her favorite roles include Laurey in Oklahoma!, Nina in In the Heights, and Gingy in Shrek the Musical. When Jade is not rehearsing or performing in a musical, she is often teaching dance. She teaches hip hop, tap, and musical theatre to kids aged from 2-18. 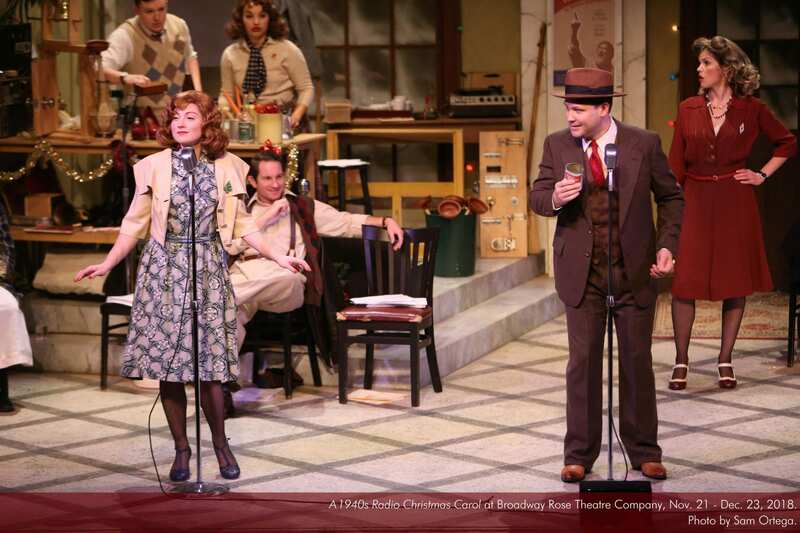 Joe Theissen (Fritz Canigliaro) is grateful to be returning to the Broadway Rose stage. You may have seen him this past summer as Nathan Detroit in Broadway Rose's production of Guys and Dolls. Other Broadway Rose roles include The Narrator in Fly By Night, Harold Hill in The Music Man, and Andre in Dirty Rotten Scoundrels. Other regional credits include Beauty and the Beast and La Cage Aux Folles at Pixie Dust Productions, Heathers: The Musical and [title of show] at triangle productions!, and Junie B. Jones at Oregon Children’s Theatre. Joe has sung with the Trinity Consort and has provided studio vocals for OCP Recordings and Pink Martini. 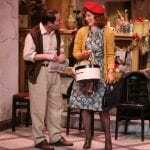 Malia Tippets (Margie O'Brien) is so excited to be back on the Broadway Rose Stage. Holding a degree in theatre performance from Marymount Manhattan College, she spent her college years performing in New York and went on to tour the nation in the mega-musical Evita as Eva Peron. Returning to New York, she was featured in the “Town Hall: Rising Stars of Broadway” concert. She spent two years in Japan, performing as Elphaba in the Universal Studios production of Wicked, before returning to Portland. Favorite Portland credits include Carrie: The Musical (Carrie White), Fly By Night (Daphne) and Heathers: The Musical (Veronica Sawyer). Jackson Wells ("Little" Jackie Sparks) is a homeschooled high school senior who enjoys theatre, singing, acting, dancing, reading, and Disneyland. He recently played Jimmy Biddle in Pete the Cat: The Musical at Oregon Children's Theatre, Ensemble/Anthony U/S in Sweeney Todd at Enlightened Theatrics, Jake in John Hughes High: The 1980's Teen Musical at Staged!, Dance ensemble/ Featured Character in Annie Get Your Gun at Elsinore Theatre), and Buddy in Elf: The Musical at Journey Theater Arts Group. Jackson will perform in The Starlings Present: Dinosaurs! with Northwest Children’s Theatre this winter. 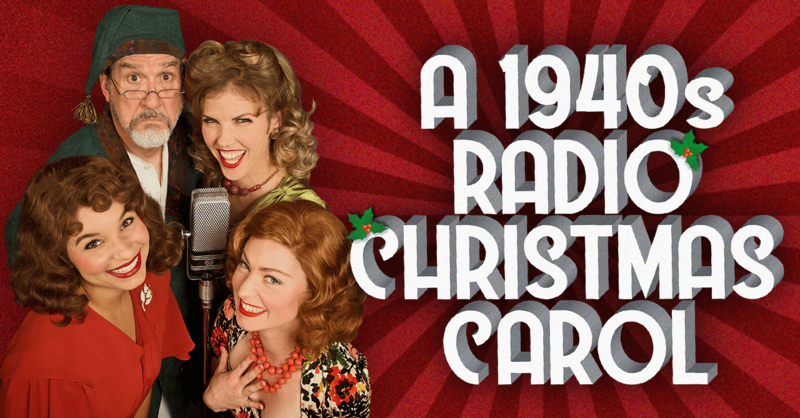 A 1940’s Radio Christmas Carol is a little different from our usual fare. That’s what first intrigued me about the project. There is some traditional holiday music as well as a few new tunes, which is always exciting. The cast is a bit larger than we are used to in the holiday show and there is definitely more of a storyline. When reading the script, I found myself laughing out loud at some of the lines and antics that ensue as they try to pull of this wacky version of Charles Dickens’ A Christmas Carol. Then before I knew it, I was getting sentimental over some of the more poignant moments in the piece. 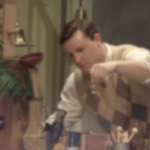 This musical is set against the backdrop of WWII, an era that has gathered a sort of romantic patina although it was a particularly difficult time in our nation’s history. 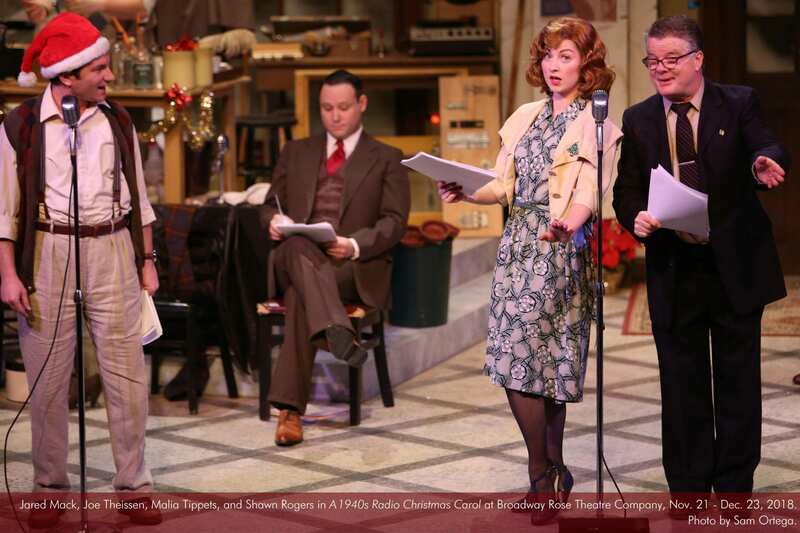 No doubt the beautiful music and storytelling magic of a radio drama broadcast offered people a respite from the news of the day and gave families a chance to gather together. I hope this show does the same for you, so that whatever you are celebrating this holiday season, you’re able to create the memories you can look back on fondly years from now. 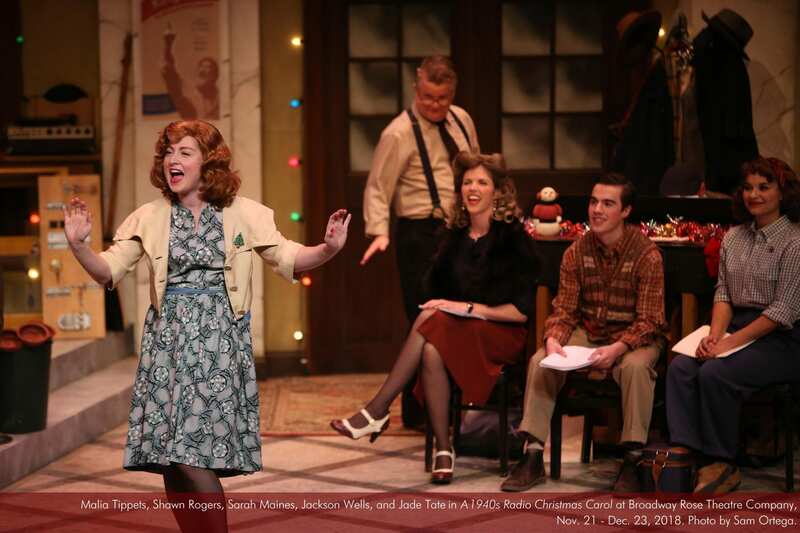 It’s a holiday show / history lesson / hilarious comedy all in one – fun for the whole family… Read more. 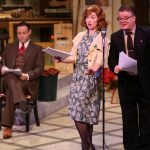 For a lively, melodic take on the olden days, particularly the golden age of radio, tune in to this show… Read more. …the most charming, touching, and musically thrilling (some of the harmonies gave me chills!) 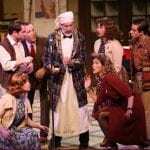 take on the “Radio Christmas Carol” genre I’ve seen – with no sacrifice in the quality of the comedy... Read more. 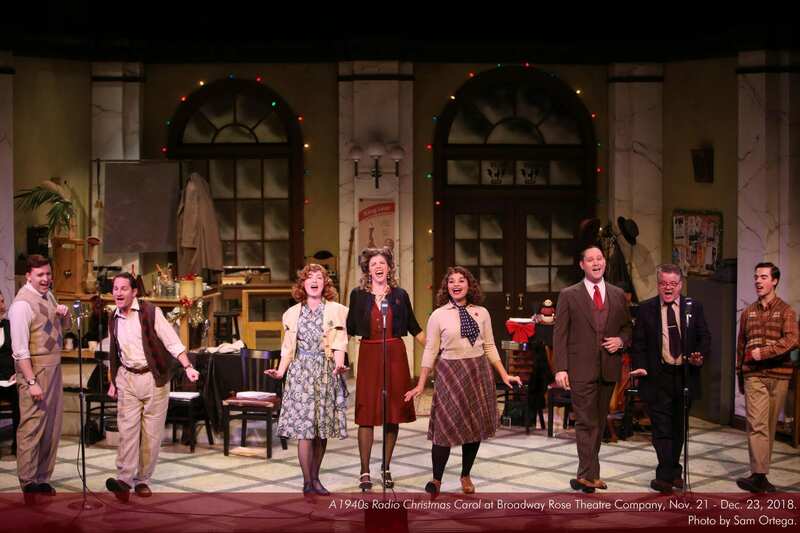 …spirited performances complete with interesting and comical special effects, some wonderful a cappella holiday tunes directed by Toots Navarre (musical director Jeffrey Childs), and a lot of laughs… Read more. 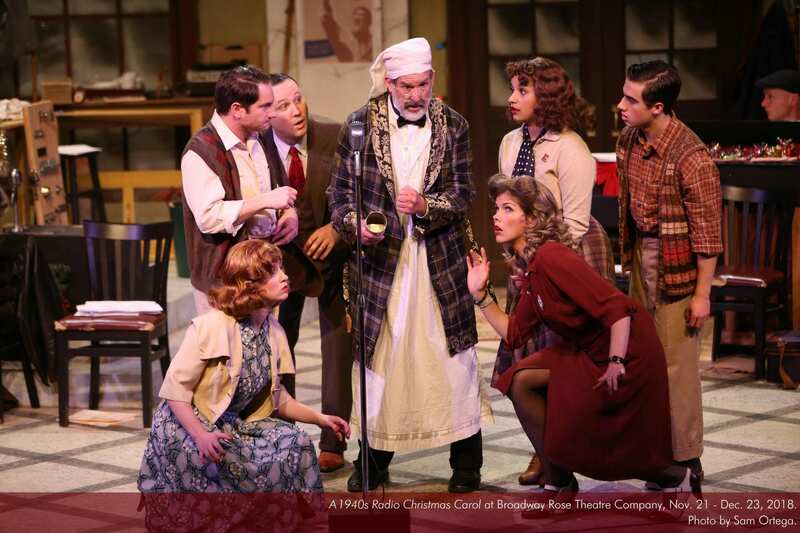 “A 1940s Radio Christmas Carol” is remarkably different from Broadway Rose’s usual Yuletide fare… Read more. 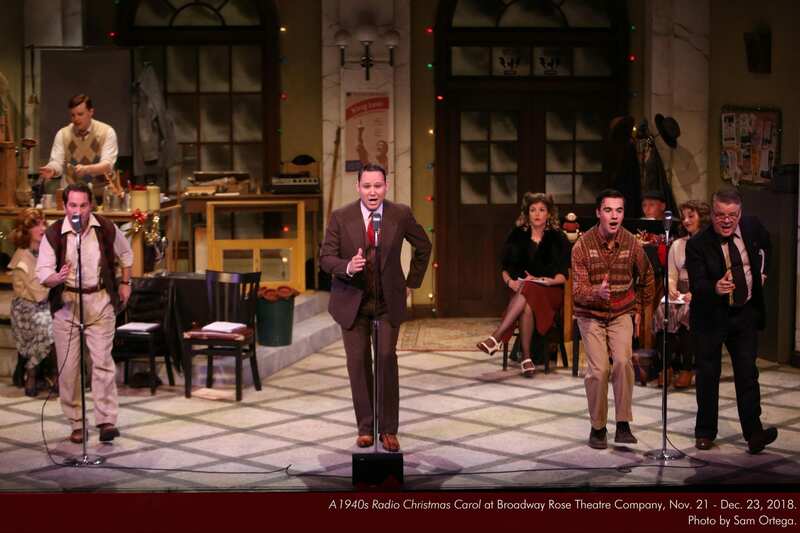 Go behind the scenes of Broadway Rose Theatre Company’s production of A 1940s Radio Christmas Carol with William Shindler, who plays foley artist Isadore “Buzz” Crenshaw… Watch now.